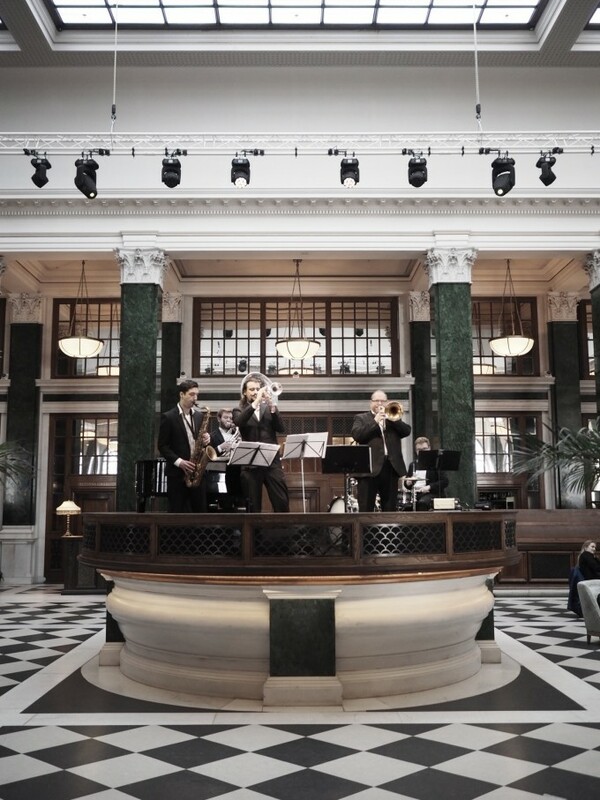 Between the enormous skyscrapers and endless regeneration of Victoria sits the newly opened Rail House café. The third venture from the company behind The Riding House Café and Village East in Fitzrovia and Bermondsey. Rail House Café, open from 7:30 for breakfast until 11:30 for dinner is set across two floors within very modern architecture dominated by steel work and glass. Rail House Café manages to encompass a warm and uniquely designed atmosphere. Large interesting rope light fittings hang along one side, cool greens, creams, rich upholstery and tiles are found throughout pulling together a warm and lived in Hamptons style feel to this vast space. There’s a large bar for more informal dining and drinking where cocktails are original and worth trying. Saffron Spritz, with saffron infused gin, rhubarb liqueur, rose and tonic. Another favourite was the Sencha Sour, Taiken Shochu, limoncello, matcha green tea, elderflower and egg white. Originality and good quality ingredients prevail. Ilias Patsios heads up the kitchen here, having previously worked with Alain Ducasse at the Dorchester, Orrery and Rhodes 24. 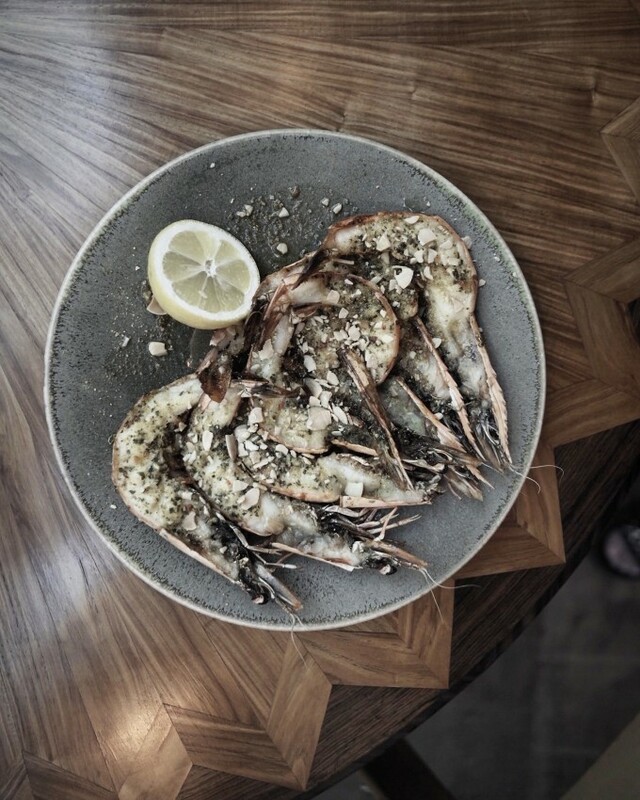 You can expect the most exciting of menus, an entire raw section, that’s not to be overlooked, small plates, enormous indulgent burger style sandwiches, grilled tiger prawns and plenty of beautiful salads and grain dishes all with a nod to Asian cuisine. We feast on a selection of sharing plates from the ‘sharing larder’ and ‘sharing raw’ sections; heritage beetroot, goat’s cheese mousse and mustard leaves, visually beautiful and delicious fresh vibrant ingredients, cured Cornish mackerel, tomato, fennel and pickled radish. From the raw bar, the cured salmon tartare comes highly recommended, served with green apple, preserved lemon, ikura, crème fraiche and spring onions. So good we would of ordered a second portion given the chance. The yellow fin tuna tartare, crispy shallots, avocado, wasabi and mirin dressing too makes for the most delicious fresh spring dish. I continue along the Asian theme with a larger plate of warm coconut chicken and rice, peanuts and herbs and my dining companion opts for the grilled garlic, citrus and almond king prawns. These arrive impressively displayed and generous in portion size, another triumph. We bypass the buttermilk-fried chicken burger and Reuben sandwich despite these looking entirely persuasive when arriving at the table next to us. Rail House Café is more than a safe bet, it’s enticing menu offers something for everyone while keeping you interested and impressed enough to eagerly return. This spot is a brilliant addition to Victoria’s expanding restaurant scene and one we’d without a doubt return to. For instagrammers, social media addicts or for those who just enjoy an aesthetically pleasing place to feast in; Duddell’s should be firmly on your list. The 15th century church has received much modernisation; there are whitewashed walls aplenty and a glass balcony that offers a bird’s eye view of the bustling restaurant below. From here there’s many an opportunity for the all impressive overhead shot for your feed. It’s too high for a close up or a flat lay but high enough to take in the restaurant in its entirety and get that shot worth sharing! The dark mahogany of its religious past offers some warmth and riches to the restaurant while also drawing inspiration from traditional 1960’s Hong Kong tea restaurants. The colour palette offers greens through glossy tiles that adorn the main bar and kitchen as well as brass, pale pinks and hues of blue to make this retro inspired space successfully bring together old and new. The juxtaposition is bold enough to be noticed but subtle enough to not outshine the menu. The authentic and passionate approach to Cantonese cuisine was born out of its Michelin starred Hong Kong counterpart and I imagine a star is exactly what they’re after here too. Prices are mid to high so turning up famished may require you to dig deeper than you intended but a worthwhile dig it will be! It’s not just the surroundings that you’ll be shooting with your camera. Every plate that arrives is beautifully presented, so much so it almost seems a shame to disrupt the plate. The vast selection of delicate, finely crafted dim sum on offer is essential to explore as is the Duddell’s peking duck, which comes with eight types of condiment no less! This was the dish that seemed to be gracing most tables, although unfortunately not ours as I lunch with the vegetarian husband. From a distance it’s absolutely evident I was missing out. I enviously watched order after order of duck be ceremoniously and expertly carved at various dining tables. Crispy salted chicken, Duddell’s supreme lobster noodles and truffle roasted black cod with lily bulb and Nameko mushrooms in Chinese aged vinegar all look as pretty as a picture and come highly recommended by the staff. It’s the laborious traditional cooking methods and unique dishes that set this restaurant apart. Quality produce and attention to detail paired with unique twists on classic style dishes make the menu interesting and appetising. The vegetarian husband was also more than looked after with mock meat style dishes; vegetarian chicken with garlic shoot in porcini sauce and black pepper vegetarian chicken which felt far from an after thought. Entirely picturesque, this chocolate box cottage sits symmetrically at the end of a very well-kept path. Lined with row after row of vegetables, leafy stalks of rhubarb greet us followed by an assortment of fresh herbs complete with blossom. Having not had a chance to do my research (instead just basing our reservation on recommendations, of which there was plenty) we are sold on first impressions! The restaurant is absolutely what is says on the box; a beautifully simplistic cottage, adorned with stacked jars of pickles, vegetables fermenting and wines well stacked and stored. The walls are cream and clean, the early evening light spills in through the front windows and fills this simplistic yet beautiful peaceful space. There are two rooms; the one we reside in has two long tables, old school chairs, and feels airy and calm. The open petite kitchen is just behind us. Everything that arrives feels very connected and so aligned to this beautiful space and the gardens that surround it. Each of the seven dishes that we devour is plated on incredible hand-turned pottery, rustic and desirable but not distracting to its contents. The shared tables give the feeling of intimacy, you could easily be mistaken for thinking this is a supper club in someone’s home. Service is friendly and informal while informative. Drinks are beautifully crafted and delicate in flavour. As a dirty martini lover, I opted for the Gardener’s Martini, The Botanists Islay Gin, Belsazar rose, vermouth, rhubarb. In equal parts dry, clean with a hint of brine and salt. The drinks’ list is one to be worked through; unique and interesting and recommendations are worth taking as the staff know what this menu inside and out. The ever changing menu is set for everyone to sample. The braised and roasted carrot salad with carrot puree and fresh cheese is a highlight, flavours feel clean and well matched and close to the surrounding environment. The lobster, wild leeks, channel wrack, cashew puree arrives perfectly cooked, sweet and fresh with the cashews adding a more neutral setting for the lobster to take centre stage. Deer, cauliflower puree, wild garlic comes next. Rich and smooth in texture we love this dish: an incredible red wine jus accompanies it, adding to the luxury of the well matched dish. 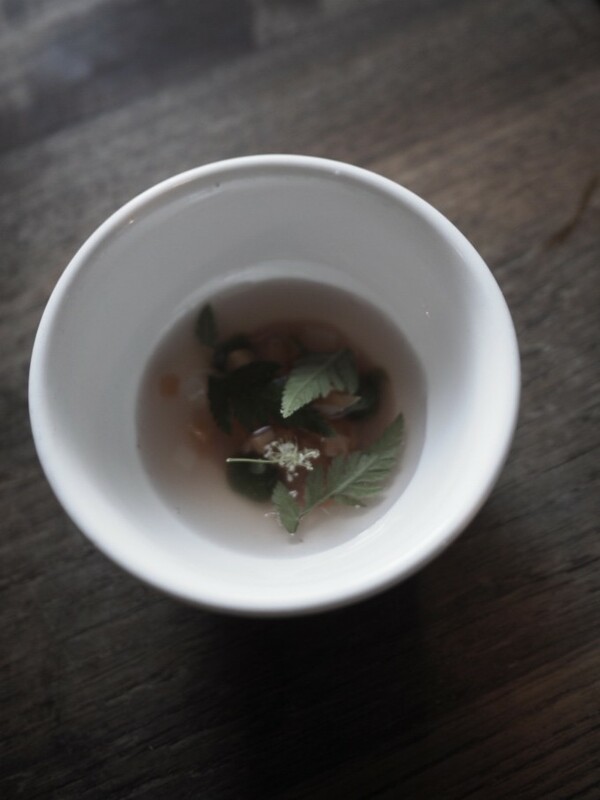 After such a rich dish (which I’d eat again right) now comes a spring time broth to cleanse the palette ahead of the preserved pear and honeycomb which although full we’re not painfully so meaning we devour eagerly. This very complimentary concoction feels rural, apt and in line with our surroundings. We finish on a second sweet of apple and marjoram. Definitely full and relishing every mouthful we’re more than content, in fact giddy with fullness. Wine, biodynamic and perfectly paired with each course was a credit the team choosing it. Such a treat it was to find this hidden spot that we’d recommend it to anyone visiting the city. Calm, low key with acute attention to detail makes for a really uniquely rural experience. In the heart of Clerkenwell is the fifth venture from Stevie Parle. Roman inspired and packing in over eighteen savoury dishes across antipasti, primi, secondi plus the most indulgent of contorni (sides), and that’s before you even make it to dessert, which I didn’t! Anywhere that greets you with a pizza bianco or fresh rosemary focaccia with a generous potato layer is a place that I’m more than like to entirely love. The vast, industrial, open plan hundred plus seater restaurant has a combination of booths, bar seating and two long tables that accommodate at least twenty encouraging group or shared social style dining. We start the meal with salt cod crudo and blood orange, which works as the perfect juxtaposition, both laden with 2016 Cappezana olive oil. Quality of produce comes high on the priority list here with this dish balancing both salty, sweet, sharp and earthy flavours. Totally delicious and we could of ordered a second plate easily. We also order antipasti of tempura sage leaves with honey and vinegar, an inspired combination that perfectly whets our appetite enough for us to enormously over order on primi and secondi. 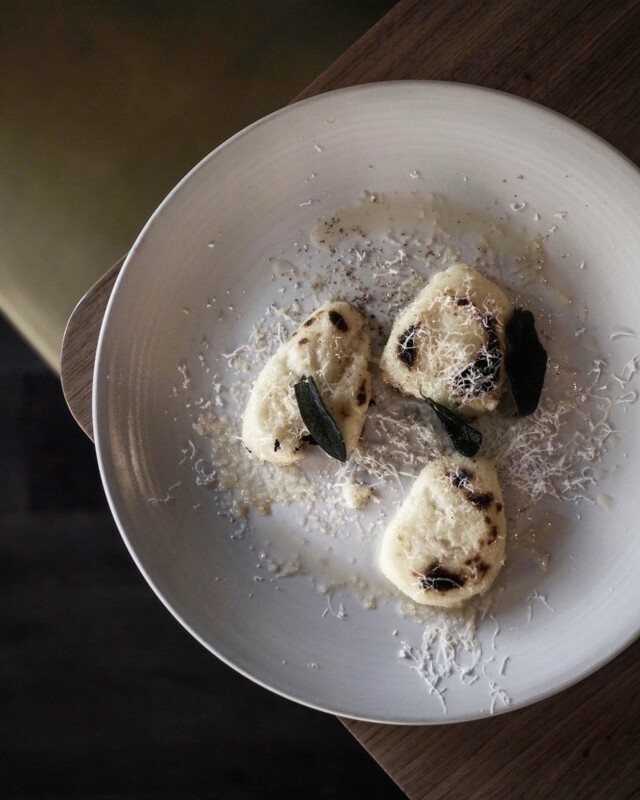 Gnocchi alla Romana, brown butter and sage; three generous lumps of smooth, rich and buttery potato alongside the Bombolotti. Ragu ‘Marcella’ arrives next, a light ragu with plenty of garlic and Parmesan which has me more than interested. I also under duress order a portion of the chicken, pancetta and pistachio meatballs with the creamiest polenta. Despite our complete over ordering of carbs we are easily convinced by the waitress to try a side of crispy fried gnocchi with Parmesan, garlic, rosemary and chilli…on top of everything else. We excitedly scoff mouthful after mouthful of each dish sharing everything to make sure we get several visits to each plate. There’s without doubt enough for an entire other meal so we happily have the rest packed up for seconds later. This is a great addition to an already extremely successful string of restaurants. Anyone with such a passion and vision for Italian cuisine has my attention and everybody else’s it would seem! Finally onto the Malibu Kitchen and we couldn’t have been more happy to kick-start our weekend on the periphery of the main hall, where we sat in a sunlit spot beneath the enormous windows that surround the space, a calm and bright booth that felt apt for our early lunch. We started with some shots of goodness, turmeric and black pepper to be precise followed by two of The Alchemists; Kale, cucumber, spinach, mint, fennel, ginger and lemon before going on to sample close to the whole menu, which does still include wine). Plates are for sharing and arrive generously portioned. The Vegetarian (Husband) is well and truly in his element here as would any vegan or health conscious person be. The menu is full of flavoursome, filling and unique dishes. This really is a menu to be excited about, having visited LA earlier this year it was so apparent how far behind London’s plant based efforts are but this definitely feels like more than a step in the right direction. Its spot on! Drawing from a plethora of cuisines the menu is exciting and rich in flavour. We start with raw vegetable summer style rolls, packed full of herbs, raw mushroom and with a generous sweet and spicy dipping sauce. Courgette and almond flatbread topped with cherry tomatoes, basil and oregano which offered a unique twist. The flatbread isn’t made of bread but dehydrated courgettes, a rather brilliant alternative to your every day stodge. There’s a raw and cured section which has me interested from the get go, cured ham, melon, bee pollen, chilli, ceviche, octopus, shrimp, lime, coriander, plantain chips are all tempting options. I end up ordering the Ahi tuna poke, avocado, sesame, jalapeño and brown rice in my quest to keep it healthy but fail a little further down the line when I see the sea bream tacos with green papaya and pico de gallo which are incidentally delicious and every bit reminiscent of the many I consumed in sunny California. There’s also a whole bass and Cornish beef fillet on the menu. For The Vegetarian, the options are endless and this doesn’t happen often! Asides from the egg white omelette, avocado on toast, grain bowl, lemon ricotta pancake and acai bowl there’s some interesting options to choose from; curly kale, red pecan nuts, radish, sprouts, ginger and miso or the young coconut, green papaya, raw vegetables, heart of palm, spicy nuts. We try the beetroot tartare, cucumber, champagne vinagrette, pistachios, almond aioli and what a delicious well balanced creation it is. The roasted (Chinese) cauliflower steaks with spiced chickpeas, parsley and garlic yogurt has him more than full. This is worth a try for anyone in need of some healthy summer inspiration. I’m already rebooking for the husband’s birthday and we’ll be taking all our vegetarian and vegan friends too. Finally!! 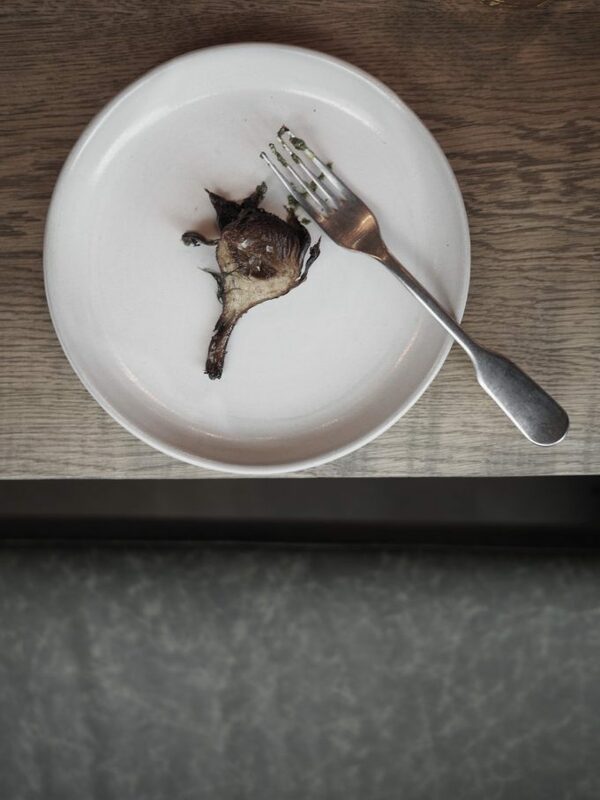 Luca is the latest venture from Johnny Smith and Isaac Hale, the team behind Shoreditch’s Michelin starred Clove Club. Here, they continue to pay homage to British produce but this time with an Italian focus, putting pasta at the forefront of their menu. This undoubtedly has me interested. Produce-wise think; Morecambe Bay shrimp, Cornish lamb chops, Wiltshire truffle, samphire, Cornish monkfish with a generous ode to Italy with its 5 ages of Parmesan vacca Bianca modenese: which we absolutely weren’t leaving without trying. The same applies for the baked chocolate mousse and prune kernel cream! The restaurant itself feels divided, in the most positive of ways. On arriving you could easily be mistaken for thinking you’re back in the 1950’s, green modernist leather and mahogany booths against the raw pink plaster walls make up the more informal bar area. Open from 8am through to the evening, where espressos, pastries and small plates are available throughout the day. If the bold green tiled exterior isn’t enough to entice you in then the bar area will. I’d recommend you chance your arm and see whether one of these beautiful 50’s booths is available which are kept for walk-ins. Get in there early and you might even get a peek at the chefs rolling out fresh pasta. One of the two private dining rooms doubles up as their pasta kitchen and offers an intimate family style dining arrangement. As you walk through beyond the bar, past the extensive array of wines, the restaurant opens up into a bright and more modern feeling environment. This is undoubtedly a beautifully curated space, which has a menu to match. We took the waiters lead and worked our way through the menu with the sommelier pairing the wines. The Vegetarian being generously catered for excitedly matched me course for course. A good balance of simplistic, classic-style dishes plus plenty with much more intrigue are boldly placed within the menu. Parmesan polenta fries arrive for us to sample ahead the four more courses we courageously order. When done well, as they were, these are completely addictive. For the antipasti, we order the shaved fennel, toasted hazelnut and pear salad along with the devilled Cornish spider crab bruschetta. This dish arrives almost soup like, sweet and doused in breadcrumbs, this is a great start and bodes well for what else is to come. Completely delicious. Unable to resist any form of pasta I opt for the garganelli with pork sausage, anchovy and mint. The mint adding an interesting, and slightly elevating, note to a deeply indulgent rich and well peppered sauce. The Vegetarian tucks into the most buttery silky ravioli I’ve tasted: packed with pumpkin, sage and chestnut emulsion and topped with Parmesan and ginger. This really did cement for me their ability at fine dining pasta. For my main course I’m barely cajoled into ordering the rump of Hereford beef stuffed with pancetta, salsify, mushrooms and kale juice, which is too generous in size for what room I have left (I couldn’t say no to the freshly baked bread offering which may have set me back space wise). It’s luxurious in every aspect: glossy jus, rare steak balanced with earthy tones from the mushrooms and kale. The warm autumn vegetables, goats curd and Wiltshire truffle more than satiate The Vegetarian, combining textures and flavours that sit vibrantly together and pretty on the plate. When it comes to dessert, we order the baked chocolate mousse and prune kernel cream plus the five ages of Parmesan. It’s at this stage, a good few hours in, that the double espresso brings us back round. Even if we consume it a little early for true Italians! The baked chocolate mousse works: completely morish, velevety, as you’d expect, and not overly sweet. The 5 ages of Parmesan is a respectful tribute to Italian produce, while also champions Luca’s know-how of it, we sample Parmesan up to 48 months matured with fresh pear and chestnut honey. This for me is exciting: the honey soothing, and counteracting, some of the more numbing tones of the aged Parmesan. This long lunch really makes for the ideal Saturday afternoon. Having traveled much of Italy (and were married there last year) we were confident we had good markers on what constitutes great Italian food. Given that, I would safely say that this restaurant should be on your list of must visits. It’s entirely charming in its surroundings and both service and food, most importantly, is delectable. 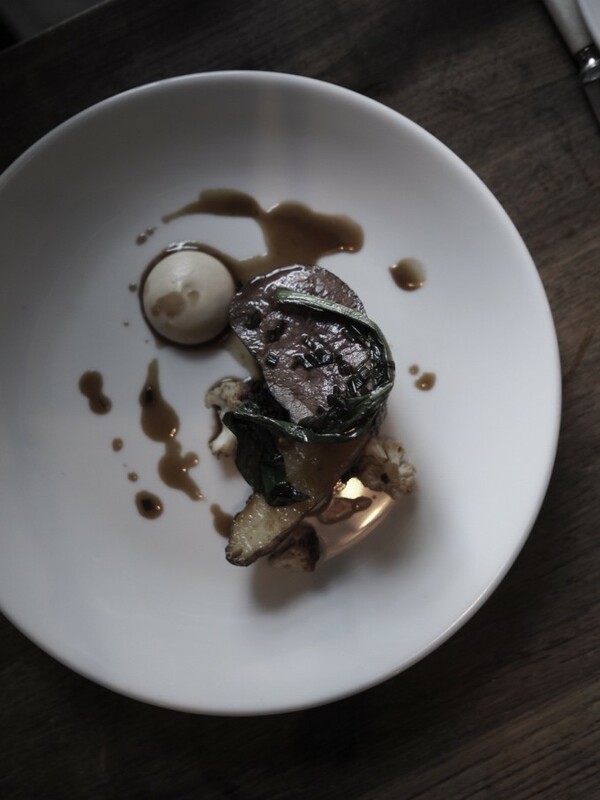 Set within the shadows of Edinburgh castle, this nineteenth century warehouse, once housing props and costumes then timber before becoming the vast restaurant space it is today, offers an incredible culinary journey, incorporating all that’s local, home grown, sustainably sourced and organic. Stripped back with exposed steel girdles and double height timber ceilings creating the perfect cocoon for the precious array of dishes being served. This place instantly feels special. Aesthetic is backed up with substance and unique flavours and combinations of those flavours. Although we run out of time for a tour there’s outdoor seating and a private outdoor area, also complete with fire, that accommodates up to ten and looks like a more than perfect spot to spend an evening with friends. My line of questioning when trawling the drinks list starts with the cocktails. Obscure concoctions arrive deliciously and subtly mixed including the oxidised vermouth, trout skin, cleavers, vodka and the plum, mint and caraway aquavit. Delicate, clean and fresh on the palette, surprisingly so given what my mind had already preconceived. Another we’re curious to try, but don’t get round to, is the chicken skin, cep, salt yeast caramel whisky. Completely compelling and unlikely pairings have us intrigued at the menu to come. To my delight tasting menus arrive: one entirely vegetarian, one pescatarian, one vegan and one including meat. Of course this would be the way here; so modern in its approach to all things consumable that they’re in touch with the demands of today. There’s the option of four, six or eight course menu. Four courses starting from £45, six courses at £55 and for dinner you can opt for the full eight courses at £75. We’re there for lunch so choose the four courses, in fact I sample the vegetarian menu, an ode to The Vegetarian husband who’s absent for this meal, my dining companion chooses the pescatarian. Even in choosing a set menu, you’re given options to choose between. You get the sense the chefs are keen to please which is always a welcome relief. Home baked rye bread arrives with home cured salami and pickled gherkin plus a generously salted butter. The true appreciation for this place starts here! Dishes of home-made cheese, lovage, tomato and fennel follow, on arriving a herbed light sauce almost like a broth is added to the prettiest of rustic hand turned ceramic bowls. Simplistic and fresh with an earthy garden note. Next the we both opt for the asparagus, goats butter, truffle, hemp, herbs. So delicate and beautiful in it’s presentation you almost don’t want to disturb the display. Layers of herbs and subtle flavours sit alongside the variation of herbs and crunch of hemp seeds. It’s delicious. Next our menus part ways, the artichoke, sunflower seed, onion, apple, smoked butter arrives for me and a plate of buttery halibut, clams, salsify, artichoke and white asparagus for my companion. Both equally seduced by the dishes in front of us that we barely take a breath, other than to share the fare in front of us with mutual appreciation. Dessert is strawberry, lemon verbena, sheep’s milk which covers all textures and levels of tartness balanced out with creamier variations. These ever changing menus, reliant on seasonality of produce and what can be foraged that day are what make us fall head over heals for this place. Service is on point, not too fussy, super friendly and people you’d imagine being friends with, all obviously passionate and proud of what they’re part of. If you’re like me and have an never ending list of restaurants to try then add this one to it, just make sure you get round to making that reservation. The latest addition to east London’s food scene is all-day Italian restaurant Passo. Headed up by head chef Massimo Laquinoto who brings with him a wealth of authentic Italian experience, having trained at the two Michelin starred Locanda Don Serafino in south east Sicily and having since worked with the likes of Locatelli. He seems like a safe bet in my books and safe bet he is too…the food here speaks for itself. Ragu is my gauge when it comes to Italian dishes (as is pizza…in fact any pasta dish, I’m easily swayed!) and on both accounts this restaurant passes with flying colours. The wild boar pappardelle, taleggio, with a port sauce is one for those that crave the richest, most indulgent of dishes. Entirely decadently rich in fact, perfectly seasoned and plentiful in it’s portion. But before I get carried away with the pasta, small plates should not be overlooked. Fried artichokes with green sauce, a very fine blitzed salsa verde, perfectly simplistic, packed with heaps of flavour, just the right texture combination. Order two of these if your dining companion is keen to share, you won’t want to portion this up! Burrata, zucchini chips with a mint and basil oil again falls into the perfectly pared back category which champions quality produce, for a brief moment I thought that my summer of oding on burrata would kill any enthusiasm for this dish but luckily that wasn’t the case, fried courgette with mint scooped up with burrata, sea salt and freshly baked bread should never be overlooked or bypassed when on the menu! Beef and Mortadella meatballs in tomato sauce also find their way into our order, again rich but with a point of difference, and a welcome flavour combination. From the salad section we opt for the Passo cesear minus any chicken. Delicious, anchovy heavy and crisp, a great breather in amongst the greediest of orders. Ravioli from the pasta section is again on the rich side, filled with burrata and served with tomato and langoustines reduction, it’s a flavoursome and hearty dish that would be more than sufficient if ordered on it’s own. Pizza here span a large part of the menu, with eight varieties listed. With it being an all-day eatery, serving up take away coffee, a lunch buffet and pizzas to go we had to at least try one…wild mushroom, spinach, gorgonzola and thyme takes our fancy, we watch in the open wood fire as it’s cooked up in the open kitchen. This feels like a great additions to old streets food scene, with and outdoor dining area on the cards should the weather prevail and room to cater for large parties this restaurant should absolutely be on your list to try especial for those who are as avid a fan as I am of Italian cuisine. Artichokes are a classic Italian antipasti and we source ours from Puglia, a region of Italy famous for its artichokes. The town of San Fernando even holds an annual artichoke festival. Recipe for our simple Fried Artichokes…. Peel the garlic and pick the herb leaves, then finely chop on a large board with the capers and gherkins. Place in blender and add the mustard and vinegar, then slowly add the oil stirring it in until you achieve the right consistency. Blend until quite smooth. After visiting this Christmas, I would love to say Petersham Nurseries is Richmond’s hidden gem but the truth is the cat is well and truly out the bag with this one. It may feel otherworldly hidden away at the other end of a long muddy track but upon arrival it’s apparent this place has a strong following already. Petersham Nurseries comprises of a bountiful shop of homewares, plant pots, mirrors, beautiful glassware, bespoke toiletries and the list goes on. There’s a tearoom, restaurant and several additional greenhouses packed to the rafters with plants. So enthralled by this wonderland we break before dessert for yet more much needed Christmas shopping. The restaurant is very much set within what you’d expect from a garden centre. Clay interior floors meet with muddy exterior whilst plants every which way you look create the most picturesque and festive of atmospheres. There’s no doubt that this is a special place to be and on a sunny, blue-skied Winter’s day it proves an even more spectacular place to visit. Fairy lights adorn every inch of the trailing climbers, transforming the room into a perfect festive wonderland. The light relief that comes with country air, greenery and several sparkling drinks only adds to the festive cheer. Jars of various home grown pickled vegetables frame the kitchen where we sample all the waiter’s recommendations. Appetisers of bagna cauda with autumn vegetables and pizzetta with taleggio and sage merely prove to whet our appetite before the starters arrive. We’re greeted with a unique and delicious radicchio and red wine risotto plus a Portland crab with shaved fennel, radish, pink radicchio and orange. A focus on seasonality and vegetables dominants the menu here, which offers simplistic, utterly beautiful, vibrant dishes which continually pass us throughout the meal. Making decisions here isn’t easy so trust your instincts (or the waiters). If the option had of been there to sample the entire menu we would have. Instead we opted for the whole squid stuffed with black rice, saffron, mussels and sea beet, which arrived beautifully presented and both rich and light in equal measure. The thick squid ink rice counteracted beautifully with the light saffron broth, which incidentally I would have drank straight from a jug. I took one for the team and on behalf of The Vegetarian (husband) who was otherwise engaged and tried the pumpkin and chard parmigiana. For me vegetarian cooking tests a chef’s skills to the limit. Meat can often sell itself needing very little to make it extraordinary but a vegetable dish often needs a little more attention to make it menu-worthy and desirable to all, not just vegetarians. The parmigiana fully delivered arriving rich with crème fraiche, (slightly under ‘cheesed’ for me but I live for that richness and endless crunchy cheese crusts). I’m always a sucker for a crunchy, crisp wild leaf salad drowned in a salty, citrus and mustard dressing and know The Vegetarian would have felt the same. Even with our shopping break ahead of dessert I knew I was stretching myself and my stomach but ever committed to covering the full menu we couldn’t leave without sampling the chia and date pudding along with a cheese selection. It’s fair to say we weren’t far off rolling out of there after a mere five hour lunch. This place really is the perfect spot for a celebration or a day trip which seems worlds away from the chaotic London life I’m so accustomed to. I’d probably recommend some kind of trolley on wheels or large boot space as resisting the temptation to shop is something that requires a huge amount of restraint. I juggled five bags of plants, leather gardening gloves, glass pots plus one large wreath for the grandparents all the way home on the train…how could I resist? One long lunch visit and half of my Christmas gifting was complete. Long lunches don’t come better than this. 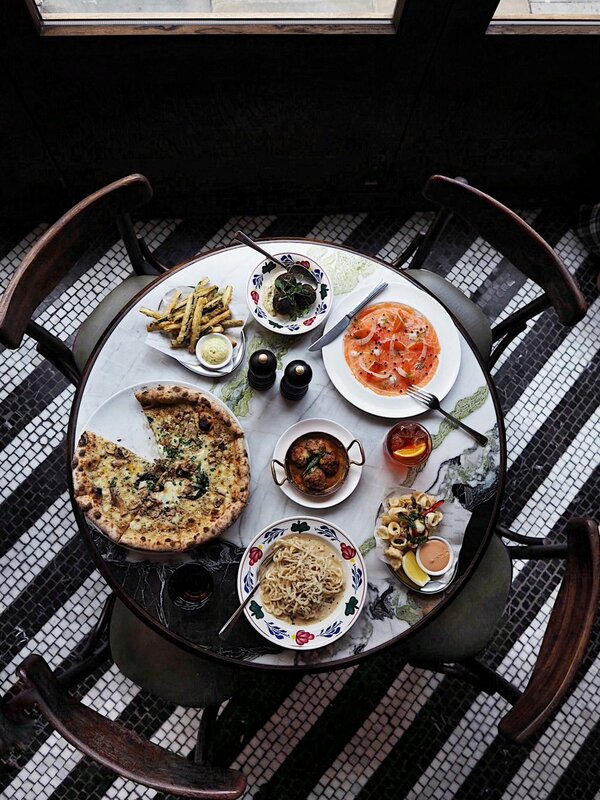 We started early and worked our way through the menu at the newly opened cecconis shoreditch - Completely obsessed with the sharing bowls of pasta. I want to eat like this every day (& possibly not share)!! We opted for the giant bowls of cacio e pepe and lobster spaghetti with a side of lasagne for good measure... there were six of us!! I can’t think of a better way to spend my weekend! Who else is with me?